When you are on a visit to the capital city, New Delhi , there are plenty of options to visit near New Delhi. Plan your family vacations on a romantic gateway and indulge yourself in adventure activities. There a list of eminent hill stations close to Delhi perfect for unplanned weekend. Nainital: Nainital is also known as city of lakes. Nainital is the perfect place to escape yourself from everyday city life. Nainital is the most popular hill stations near Delhi due to its fascinating hills, seneric plains, climate and stunning lakes. The place has a religious significance for Hindus. Naini lake in Nainital is considered as Shakti peethas. Naina Devi temple was built on the banks of Naini Lake, the place where Goddess Sati is prayed in the form of Shakti. 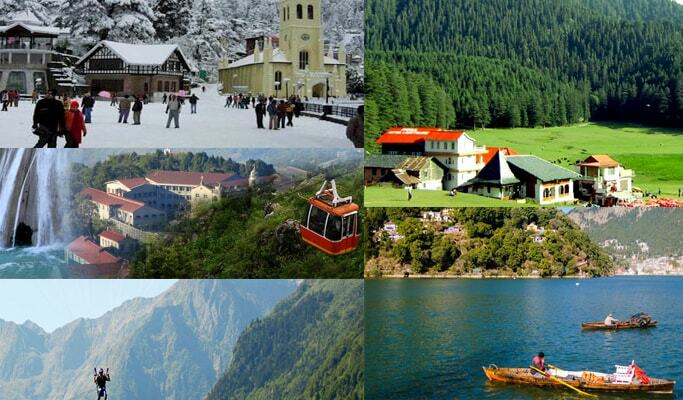 Nainital is a small hill station that draws the attention of large number of tourists from all around the world. Dalhousie : Dalhousie is a gateway to the ancient Chamba hill state in Himachal Pradesh of India. This hill station is famous for hindu culture, temples, art and handicraft, mesmeric beauty snow covered mountain peaks and pleasant climate. The place has a brilliant weather that will definitely make you fall in love with. Shimla : Shimla is located in Himachal Pradesh is the most popular hill station and major tourist destination in India. Mall road, toy train are some of the most famous attractions of the Shimla. Holidays in Shimla is suitable both for Honeymooners and families.The city has beautiful hills and lush green forests. Dharamsala : Dharamsala is known as the second winter capital of Himachal Pradesh. It attracts thousands of tourists throughout the world to enjoy the incredible climate and captivating serenity. The city was famed due to the presence of headquarters of Central Tibetan administration and Dalai Lama’s residence. Mussoorie : Mussoorie is also known as the queen of the hills is located on the foothills of the Himalayas. The place is famous vacation spot for families and Honeymooners. Mussoorie is famous for alluring beauty and charm and its delightful climate makes it one of the most beautiful hill stations near Delhi. Some famous attractions of the city are Hills and Mountains, Waterfalls, Lakes, Heritage Buildings and the Mall.